While some think of this time of year as holiday season, I tend to think of it as the season to make homemade fire cider! Fire cider is a traditional immune-supporting remedy with deep roots in folk medicine (but most popularly championed by herbalist Rosemary Gladstar). At its most basic, it’s a zesty infused vinegar, packed with powerful immune-boosting, anti-inflammatory, anti-bacterial, anti-viral, and circulatory herbs. The addition of hot peppers and a little local honey makes it both spicy and sweet, hence the name. I use homemade fire cider in a few ways—as a defense against cold and flu pathogens, at the first sign of cold symptoms, and as a decongestant and expectorant when the cold has set in. Not only an immune tonic, homemade fire cider also stimulates digestion and helps moves circulation throughout the body and to the periphery (which helps keep us warm on cold winter days!). I tend to sip a shot glass a day of this hot stuff beginning in mid-autumn and throughout the winter months. What’s So “Hot” About Homemade Fire Cider? Onions and other members of the allium family (like shallots, leeks, and especially garlic) are high in flavonoids (including quercetin and kaempferol), polyphenols, and the important constituent allicin. They are antimicrobial, antiviral, antioxidant, immune-enhancing, and anti-inflammatory, and they help enhance the action of vitamin C (Duke, 1997; Li, 2008). Horseradish strongly stimulates the digestive fire, increasing gastric secretions and appetite. It also promotes perspiration, making it useful in fevers, colds, and flu. Horseradish is also an expectorant and is mildly antibacterial. It’s often used in both respiratory and urinary tract infections (Murray et al., 2005). Ginger is warming, and it stimulates circulation of the blood (so it is used to remove pathogens from the bloodstream). It’s widely used in Ayurveda and traditional Chinese medicine to break up congestion throughout the body, including in the lungs and nasal passages. Ginger may also be used to help break fevers by warming the body and increasing perspiration. It’s also a powerful anti-inflammatory, stimulates immune activity, and can soothe nausea (Murray et al., 2005; Duke, 1997). Apple cider vinegar (ACV) and honey both have antibacterial properties and can help boost energy levels (ACV helps break down lactic acid buildup which leads to fatigue, and honey stimulates the metabolism) (Brandon, 2014; Fessenden, 2015), among other benefits. Hot peppers that are high in capsaicin (like cayenne) are a great bang for your buck in the early stages of colds because they increase circulation and mucous secretions. They move fluid from within and bring heat and moisture to the surface. They’re often used topically to ease pain and discomfort by blocking a neurotransmitter called substance P (Murray et al., 2005; Duke, 1997; Wood, 2008). Thyme is a lovely herbal ally for the respiratory system. It’s powerfully antimicrobial, thins mucus making it more easily expectorated, and is a tonic spasmolytic. It’s also a strong digestive aid and can be helpful where there’s a stomach “bug” along with cold symptoms (Wood, 2008). One of the best things about homemade fire cider is that every herbalist has their own recipe, which can be adjusted according to taste or the kind of wellness support needed. 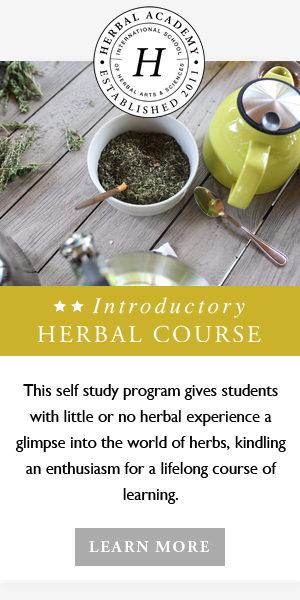 With fire cider, more than perhaps any other herbal remedy, a recipe is merely a suggestion. Remember—you can be really flexible in how you make homemade fire cider. These ingredients are a start, but you can add others. Some other great options are dried elderberries, cinnamon sticks, Echinacea, Astragalus root, even lavender flowers. Place all ingredients except honey in a half-gallon jar, and cover with raw, unpasteurized apple cider vinegar. Be sure to cover the herbs by at least few inches, then cut a square of parchment or wax paper and cover the jar before tightly capping it. Store in a warm place (I like the top of the fridge) for a few weeks, shaking the jar daily. After three weeks, your fire cider will pack a punch, but you can keep infusing for much longer if you like—I know herbalists that let their fire cider sit for months before straining it! At this point, you can strain out the herbs from the liquid, but another option is to blend the whole batch in a blender or Vitamix and let it sit for an additional week (without shaking for the last few days to let the ingredients settle) before pouring off the liquid. Either way, once you’ve finished infusing herbs, add warmed raw honey to taste (I usually add about 1/3 cup), mix thoroughly, and bottle. This doesn’t have to be refrigerated, but it can’t hurt. Homemade fire cider is so versatile! Combined with olive or avocado oil, it makes a zesty salad dressing, and you can also add it to soups and stews. This year, I even used homemade fire cider for making pickled cucumbers and okra! Soak a clean flannel cloth in fire cider and place on the chest for congestion. Mix with honey to make a soothing, expectorant cough syrup. Brandon, B. (2014). Apple cider vinegar for health. Avon, MA: Adams Media. Duke, J. (1997). The green pharmacy. Emmaus, PA: Rodale Press. Fessenden, R. (2015). The effects of honey on human metabolism. Retrieved from: http://sweetnechakohoney.ca/the-effects-of-honey-on-human-metabolism/. Li, T. S. C. (2008). Vegetables and fruits: Nutritional and therapeutic values. Boca Raton, FL: CRC Press. Murray, M., Pizzorno, J. & Pizzorno, L. (2005). The encyclopedia of healing foods. New York: Atria Books. Wood, M. The earthwise herbal: A complete guide to old world medicinal plants. Berkeley, CA: North Atlantic Press.